After the battle of Hastings, when King Harold was defeated by William the Conqueror, Harold’s mother fled to Exeter, which refused to pay allegiance to William other than that due by ancient custom. William besieged the city for 18 days in the winter of 1067-8 after which the city surrendered, but only on condition that it not be plundered or expected to pay more tax (1). William agreed, but ordered the immediate construction of a stone castle at Rougemont, and several other stone castles were built soon afterwards at Okehampton, Barnstaple and Totnes. Around Ilfracombe there were several small timber castles; in Loxhore; in Bratton Flemming and in Parracombe, where the mound of the motte is extremely well preserved (2). The Norman’s greatest legacy, as far as Hele is concerned, is not their castles, but their review of the tax system which resulted in the Doomsday survey. This remarkable document, of which there are several versions, provides a detailed insight into the use of the countryside a thousand years ago. Unfortunately, as could be expected from a Norman accountant who left no notes, the details are frustratingly ambiguous! (3). The Saxon’s appear to have passed down a sophisticated tax system where all land was owned by the King and was sublet to a large number of local lords. The basis of this system was the Manor. Typically the lord lived at the Manor house and farmed the surrounding land; in return he owed allegiance and paid tax. Manors were grouped together into Hundreds, named after the place in each Hundred where the tax was paid. A Hundred was presumably meant to represent 100 hides, a hide being roughly 120 acres. After the Norman Conquest, the land was divided between relatively few Norman lords; each holding many different Manors. No doubt one purpose of Doomsday was to register these new tenancies, probably another was to review the tax system and raise more revenue. Another may have been simplification, since the tax could now be collected from relatively few Norman lords, rather than by visiting every Hundred. Doomsday lists the Manors in each Hundred (Hele is in the Braunton Hundred) according to their landlord. The main landlord in Devon was Baldwin, Sheriff of Devon, who held 159 Devon Manors. He lived at Okehampton castle and sublet many of his holdings around Ilfracombe to Richard of Punchardon, including the Manors of Ilfracombe, Lincombe and West Haggington. The other major local landlord was Geoffrey, Bishop of Coutances, who sublet Hele, Killington, Stowford, Bittadon and part of West Hagginton to Drogo. Combe Martin was held by William of Falaise directly for the king (presumably because of the silver deposits there) and Walscin held Berrynarbor and East Hagginton and sublet the latter to Wulfric (4). Pasture, 30 acres; woodland, 20 acres; 5 cattle; 7 pigs; 20 sheep; 10 goats Formerly 5s, value now 10s"
Hele was listed under the lands held by the Bishop of Coutances and sublet to Drogo. These were the tenants in 1086, when Doomsday is thought to have been compiled, but neither of them actually lived at Hele. The previous Saxon tenant, at the death of Edward the Confessor in 1066, was Edwy; perhaps he or his heirs still lived there. Hele was taxed on ½ virgate or 15 acres (there are four virgates to a hide of 120 acres) but this figure does not seem to relate to either the land available, or the tax actually paid and may have been administrative. It appears to date from the Saxon period and may have been the basis of feudal dues (one warrior had to be provided for each hide, to defend the local fortress) and of the aggregation of Manors into Hundreds (5). There is land at Hele for three ploughs. The plough represents the arable land available and is often considered to be identical to a hide, although in the south-west it may only have been a little over 40 acres. In Devon there is close correspondence between the number of ploughs and the number of families (as in this case) so that land for 3 ploughs may be thought of as land to support 3 families (6). One plough and one furlong (a furlong is ¼ virgate, or 7½ acres) were in Lordship (i.e. for the benefit of the Manor) and were probably worked by the slave with part-time duties owed by the villager and smallholder, who worked the rest of the land for their own benefit. The Manor farm may have been at Comyn or Littletown and was probably occupied by the villager and his family. The furlong in Lordship may have been the group of fields to the south, called Yarde on the first detailed Ordnance Survey map of 1889. The plough in Lordship was probably the rest of the valley sides down to the sea. The other (nearly two) ploughs were probably on the slopes of Comyn Hill, where the smallholder may have lived with his family, perhaps at Killicleave. There were also 30 acres of pasture, presumably for the 5 cattle and the Manor plough-team. According to Exon Doomsday, the villagers also had a furlong of pasture for two oxen. There were 20 acres of forest, where the 7 pigs would have been kept; 20 sheep and 10 goats. Hele may have grown in the 20 years between the Norman conquest and Doomsday, since its value (the tax actually paid) had doubled (7). Hele was a very small Manor compared to its neighbours Haggington and Berrynarbor (each with 17 ploughs, about twice the size of Ilfracombe). Their importance was due to Berrynarbor having been a Hundred in the Saxon period, but Berrynarbor became part of Braunton Hundred in the 10th century and Haggington was divided by the Ilfracombe-Berrynarbor parish boundary. Doomsday shows that Hagginton was actually divided into three parts, held by three different lords, even before the Norman Conquest. It would be interesting to know why Haggington was divided - was it to diminish an errant lord? (8). "W(alscin) holds Berrynarbor [Hurtesberie] himself. Edith held it before 1066. It paid tax for 2 hides. Land for 17 ploughs. In lordship 4 ploughs; 6 slaves;½ hide. 20 villagers and 10 smallholders with 7 ploughs and 1½ hides. Meadow, 1 acre; pasture, 200 acres; woodland, 100 acres. 2 cobs; 11 cattle; 30 pigs; 200 sheep; 83 goats. "William of Falaise holds Combe Martin [Cumbe] from the King. Brictric and Edwy held it freely (and) jointly before 1066. It paid tax for 2 hides and 1 virgate of land. Land for 20 ploughs. In lordship 3 ploughs; 9 slaves; 3 virgates. 18 villagers and 10 smallholders with 14 ploughs and 1½ hides. "Wulfric holds Haggington [Hagetone] from W(alscin). Wulfmer and Godric held it jointly before 1066. It paid tax for 3 virgates of land. Land for 5 ploughs. In lordship 2 ploughs; 3 slaves; 1 virgate. 10 villagers and 2 smallholders with 1 plough and 2 virgates. Pasture, 100 acres; woodland, 20 acres. 10 cattle; 9 pigs; 50 sheep; 37 goats. "Robert holds Haggington [Haintone] from Baldwin. Ulf held it before 1066. It paid tax for 1 hide. Land for 10 ploughs. In lordship 2 ploughs; 2 slaves; 1 virgate. 12 villagers and 4 smallholders with 5 ploughs and 3 virgates. Pasture, 50 acres. 2 cattle; 4 pigs; 100 sheep. "Haggington [Hagintone]. Wulffrith held it before 1066 [now held by Drogo for the Bishop of Coutances]. It paid tax for 1 virgate of land. Land for 2 ploughs. 2 villagers have them there, and 1 smallholder. "Hele [Hela]. Edwy held it before 1066. It paid tax for 1/2 virgate of land. Land for 3 ploughs. In lordship 1 plough and 1 furlong, with 1 slave and 1 villager and 1 smallholder ...(who have) 1 furlong and 2 oxen in a plough. Pasture, 30 acres; woodland, 20 acres. 5 cattle; 7 pigs; 20 sheep; 10 goats. "Robert holds Ilfracombe [Alfreincome] from Baldwin. Aelmer held it before 1066. It paid tax for 1 hide. Land for 9 ploughs. In lordship 2 ploughs; 1 virgate. 12 villagers and 12 smallholder with 9 ploughs and 3 virgates; 5 slaves. "Mullacott [Molecote]. Alchere held it before 1066 [now held by Godbold]. It paid tax for 1/2 hide. Land for 4 ploughs. 2 ploughs there; 2 slaves. 5 villagers and 2 smallholders. Meadow, 1 acre; pasture, 10 acres. 4 cattle; 60 sheep. Formerly 10s; value now 20s. The following details are based on the Ordnance Survey map of 1891 (Landmark Trust, 2001 website www.old-maps.co.uk ) There are two areas to the south of Comyn farm that are marked yarde. The smaller, nearer to Comyn and marked yarde twice, is about 2½ acres and the larger, comprising three fields marked yarde three times, is about 8 acres. The larger field could be the furlong (7½ acres) in Lordship to the Manor of Hele. The remaining plough in Lordship would probably have included the small yarde field and may have comprised the surrounding valley bottom, of about 21 acres (in a crescent around the west side of the small yarde field) and possibly the valley bottom between Cat lane and Chambercombe Lane, down to Hele Village, of about 25 acres. The remaining ploughlands not in Lordship (about 70 acres) were probably on the slopes of Comyn Hill. The 20 acres of woodland were probably Comyn and Chambercombe woods. This would have been occupied by the 7 pigs. The value of Hele had doubled in the 20 years since the Conquest, from 5s to 10s. Alternatively, the manor of Hela could have been at Littletown, with the Lordship land to the west of the current settlement. There are three landlords who hold land in Haggington. The largest holding, 10 ploughs of West Haggington, is held by Robert for Baldwin. The middle holding is 5 ploughs of East Haggington, held by Wulfric for Walscin and the smallest holding is 2 ploughs in West Haggington held by Drogo for the Bishop of Coutances. East and West Haggington are either side of the Widmouth hill ridgeway (Oxenpark Lane). Presumably they were one manor when Berrynarbor was a Hundred and were subsequently divided into two manors taxed at one hide each. East Haggington appears to have lost land associated with 1/4 hide tax to West Haggington in further boundary changes (the parish boundary on the Ordnance Survey map of 1889 is shown running north along Oxenpark Lane, but at Hole farm it turns to the north-east to Watermouth. Perhaps it once continued north to Widmouth farm). East Haggington had land for 5 ploughs, about 200 acres. Presuming it was bounded by the stream from Berrynarbor to the east and the parish boundary to the west. It probably went south of the coastal ridgeway (which was probably to the south of the current main road): the area so enclosed is about 180-200 acres. However this does not leave much room for the 100 acres of pasture and 20 acres of forest ! It must have held land outside these boundaries, possibly to the east of Northfield Wood, on the other side of the stream. There were 10 villagers, 2 smallholders and 3 slaves. It is not clear where they all lived. The 1891 map shows ruins of a Manor house at E Haggington and Wulfric may have lived here, with one or more of the slaves. E Haggington, like Hele, had doubled in value since the Conquest, from 15s to 30s. West Haggington had land for 10 ploughs, about 400 acres. Presuming this was bounded to the east by the Widmouth ridgeway (Oxenpark Lane) and to the west by Hele valley: the area so enclosed is about 480 acres, sufficient for the 10 ploughs and 50 acres of pasture. There were 12 villagers, 4 smallholders and 2 slaves. The farmsteads of W Haggington, Beera, Littletown, Higher & Lower Trayne and Keypit may all have been occupied. W Haggington has the same value before and after the conquest, 60s. There were a further 2 ploughs (about 80 acres) in West Haggington. Presumably this is the land bounded by the parish boundary to the east and an extension of Widmouth ridgeway (Oxenpark Lane) to the west. This is about 100 acres, sufficient for the 2 ploughs and 20 acres of pasture. 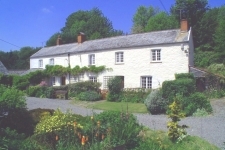 There were two villagers, possibly at Hole and Watermouth farms (Watermouth farm has since been replaced by Lydford), and a smallholder, possibly at Widmouth farm. This land has lost value since the conquest, from 10s to 6s. Presumably some of the land was no longer used.